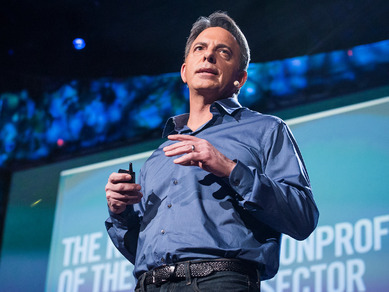 Nationally acclaimed fundraiser and nonprofit sector guru Dan Pallotta recently did a TED Talk entitled The way we think about charity is dead wrong – you can watch it here. There has been a lot of chatter about the Talk amongst the sector and people have started to ask my opinion of it, so I finally took the chance to sit down and watch the 18 minutes. It’s 18 minutes worth watching, just so you can know what the hype is about, but from a nonprofit insider standpoint, it’s (mostly) nothing new. Dan details five ways the nonprofit sector is kept small: because of closed minded thinking about compensation, marketing, risk, time, and profit in the sector. I would say that none of these five points are anything I want to jump up and down about except the third one – risk – definitely something that the sector needs to switch its aversion to if it wants to get anything meaningful done. The second part of the talk resonated more with me as a big issue that we should all stand up and pay attention to. He detailed the misconception that “overhead” is not part of the “cause,” and the fact that this misconception is ultimately forcing charities to not spend money on overhead and not expand and innovate in ways that are necessary to address such huge problems as the ones we are trying to solve. Spot on, and I especially believe this as a fundraiser. Any activity that works toward the mission of a nonprofit: whether it is purchasing meals for the homeless, paying for lights at a shelter, or paying the salary of the marketing professional, should be considered part of the “cause.” The arbitrary designation of some of these expenses as more “worthy” than others of donations is ridiculous. In order to make real change in the world, we need to support all aspects of a nonprofit’s operation, whether it is directly touching a client or not. I hope people come away from this Talk with that message at the very least. The next time you make a donation to a nonprofit, remember that they are the experts and know best where your support is the most needed. Give an unrestricted gift – you will do more for the nonprofit than you know.